Whole grains provide a variety of healthy nutrients and are naturally low in fat. Here's how to get more into your diet. Chances are you eat lots of grains already. But are they the healthiest kind? If you're like most people, you're not getting enough whole grains in your diet. Aim to choose whole grains for at least half of all the grains you eat. Read on to learn about the different types and why you should skip refined and enriched grains. Also called cereals, grains and whole grains are the seeds of grasses cultivated for food. They come in many shapes and sizes, from large kernels of popcorn to small quinoa seeds. Whole grains. These unrefined grains haven't had their bran and germ removed by milling; therefore, all of the nutrients remain intact. Whole grains are better sources of fiber and other important nutrients, such as selenium, potassium and magnesium. Whole grains are either single foods, such as brown rice and popcorn, or ingredients in products, such as buckwheat in pancakes or whole wheat in bread. Refined grains. In contrast to whole grains, refined grains are milled, a process that strips out both the bran and germ to give them a finer texture and longer shelf life. The refining process also removes many nutrients, including fiber. 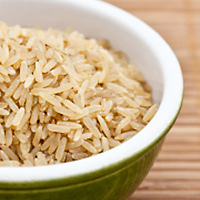 Refined grains include white flour, white rice, white bread and degermed cornflower. Many breads, cereals, crackers, desserts and pastries are made with refined grains, too. These processed foods will not keep your blood sugar levels steady, which is why you will be hungry again soon after consumption. Enriched grains. Enriched means that some or many of the nutrients that are lost during processing are added back in later. Most refined grains are enriched, and many enriched grains are also fortified — meaning nutrients that don’t occur naturally in the food are added — with other vitamins and minerals, such as folic acid and iron. Enriched grains lack fiber and are not an optimal choice because while they have traces of nutrition, many important vitamins and nutrients are lost during processing. It's not always easy to tell which grains are in a particular product, especially bread. For instance, a brown bread isn't necessarily whole wheat — the color may come from added coloring. If you're not sure something has whole grains, check the product label or the Nutrition Facts panel. Look for the word "whole" on the package, and make sure whole grains appear among the first items in the ingredient list. Substitute whole-wheat toast or whole-grain bagels for plain. Substitute low-fat bran muffins for pastries.